Krabby in game: 4,452 Who? Important notice! Pokemon Krabby is a fictional character of humans. As a crustacean, Krabby has a strong outer shell protecting its small body. Its upper half is red, containing two small spikes facing upwards on the top of its head. Its lower body is light tan and doubles as its jaw with two fangs overlapping its upper body. Its hips are visible on the lower front of its body connected to its long, thin legs, which have small, claw-like feet. 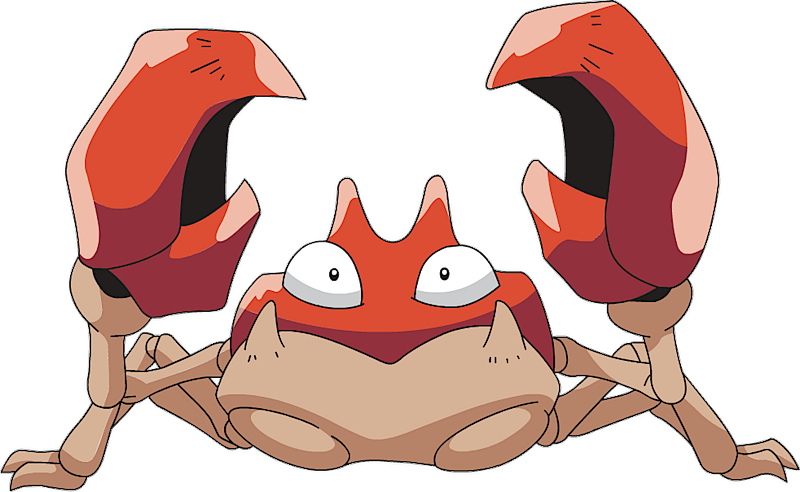 The main feature of Krabby's body is its large, red pincers. Krabby uses them as its main form of offense, and as a form of balance. 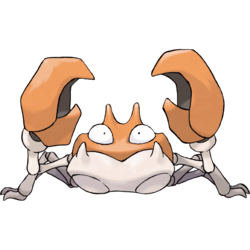 Sometimes, Krabby may lose a claw during battle, or it can forcibly remove a claw if it is damaged, and regenerate the claw over a short period. In the wild, Krabby lives near the edge of water in both fresh and salt water. Krabby is most commonly found on beaches where it burrows in the sand to live. In times of scarce food sources, it may eat sand to regain nutrients, and will be very aggressive in defending its home. Its main form of defense is composing foam to shroud its body, in order to confuse opponents into thinking that it is bigger than it actually is. 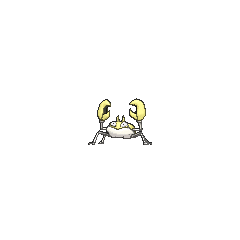 As seen in the anime, on average, Krabby generally keeps to itself, but will quickly defend itself if provoked. Ash captured a Krabby in Mystery at the Lighthouse. It was transferred to Professor Oak's lab. Ash didn't use Krabby until Round One - Begin!. After defeating an Exeggutor in its first battle, Krabby evolved into Kingler. A Krabby made an appearance in The Evolution Solution, where it grabbed Slowpoke's tail and Psyduck's head. A Krabby appeared in Expedition to Onix Island!. Gary's larger-than-average Krabby first appeared in Mystery at the Lighthouse. 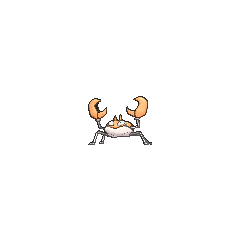 A Krabby also appeared in Island of the Giant Pokémon. Multiple Krabby also appeared in The Power of One. Two Krabby were part of an exhibition in Flower Power. A Krabby was one of the Pokémon seen at the Pokémon Swap Meet in Tricks of the Trade. A Krabby appeared in Beauty and the Breeder where it participated in a Pokémon breeding competition. Three Krabby were among the inhabitants of an oasis just for Pokémon in Got Miltank?. A Krabby also appeared in Pokémon Mystery Dungeon: Explorers of Time & Darkness. A Krabby also appeared in Teaching the Student Teacher! on the rocks. A Krabby appeared in The Island of Illusions!. A Krabby appeared in Alexa's magazine in The Journalist from Another Region!. A Krabby appeared in Going for the Gold!. 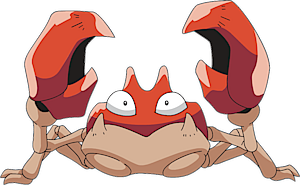 During A Tale of Ninetales in Pokémon Adventures, Red caught a Krabby off-screen while he had some Blue's Pokémon in his party by mistake. Later in What a Dragonite, after HM03 (Surf) was destroyed Krabby was traded for Misty's Gyarados, Gyara, since he already knew how to use Surf. She later appeared again with Misty worrying for Red in Do Wrong, Dewgong!. Misty later saves a Krabby trapped in Tohjo Falls in Volume 12. This act of kindness prompts Suicune to pick Misty as its Trainer, besides her being the expert for Water-type Pokémon. It is based on a crab.